Acquiring paper is addicting. 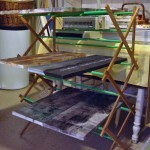 Organizing it in a small studio can be quite a challenge. Here are a few ideas that work for me. First, make labeling a habit for watercolor, printmaking and other plain papers. There’s nothing more frustrating than finding a paper you love to work with and being unable to remember what you purchased. 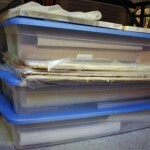 For large sheets, I often buy in bulk and just keep it flat in it’s original labeled shipping plastic. But when I cut them down, I take a pencil and lightly mark a corner so I can keep track of what it is. It can erased, cut off or just left under the matte when you frame. 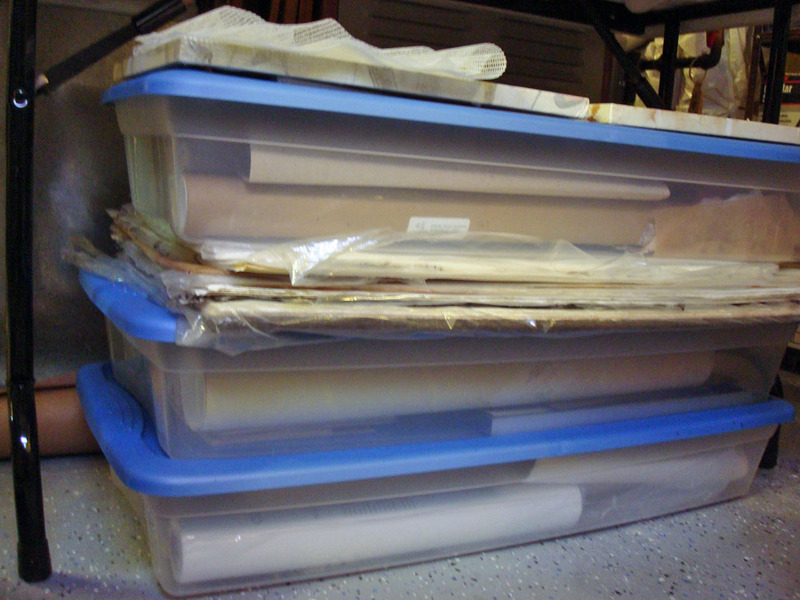 I don’t currently have room for a flat file to store large sheets of paper. So I’ve opted for a dual solution. 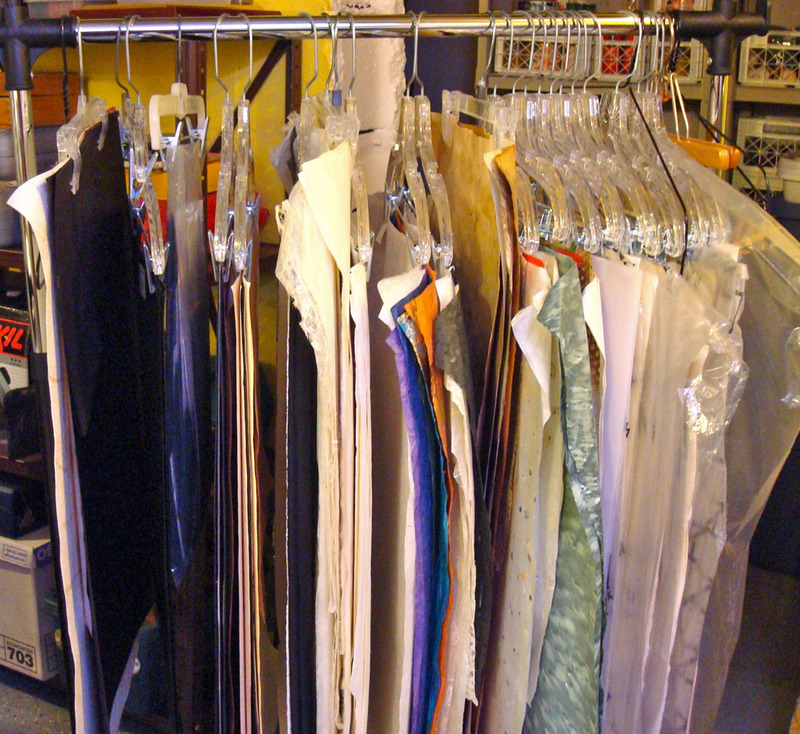 Lightweight papers are hung with clip hangers on a clothing rack, both purchased at our local Target. 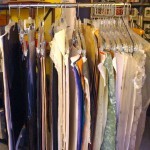 It’s much easier to sort through them that way and you can roll it around and out of the way. 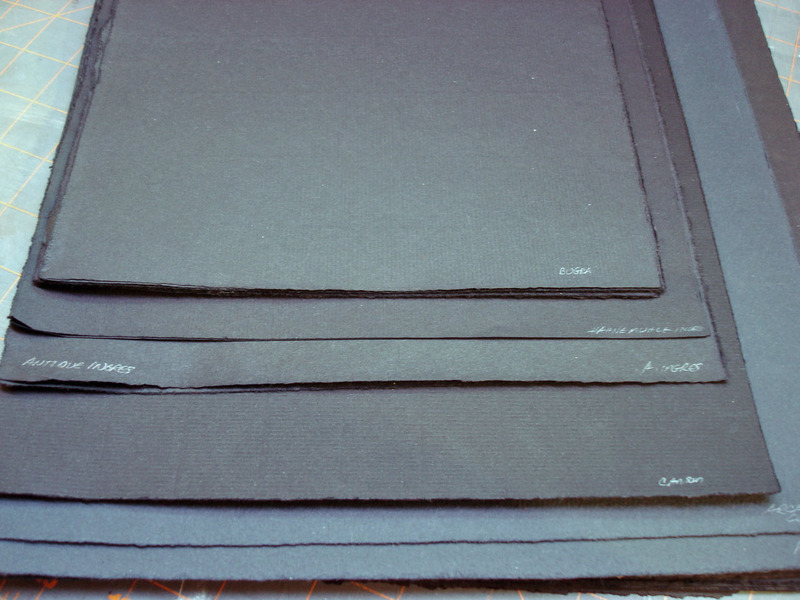 It’s not ideal, and papers that are too heavy will fall on the floor, but since most will be torn down and used for collage it’s not really important that they stay perfectly flat. Rice papers that can be rolled are stored in the flat boxes readily available at places like Target and Walmart. 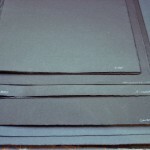 Heavier papers such as Arches Cover and watercolor stock can then be laid flat on top. I should mention that there is something wondrous in watercolor sizing that attracts small animals. You can imagine I was none to pleased to find the corners of five sheets of 300# Arches cold press eaten by my favorite poodle! I now make sure the plastic is secure. Lastly, I would be remiss if I didn’t mention a bit about canvases. 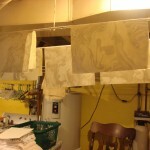 Rice paper and canvas make a lovely combination but they also need somewhere to dry. Once again, necessity was the mother of invention. 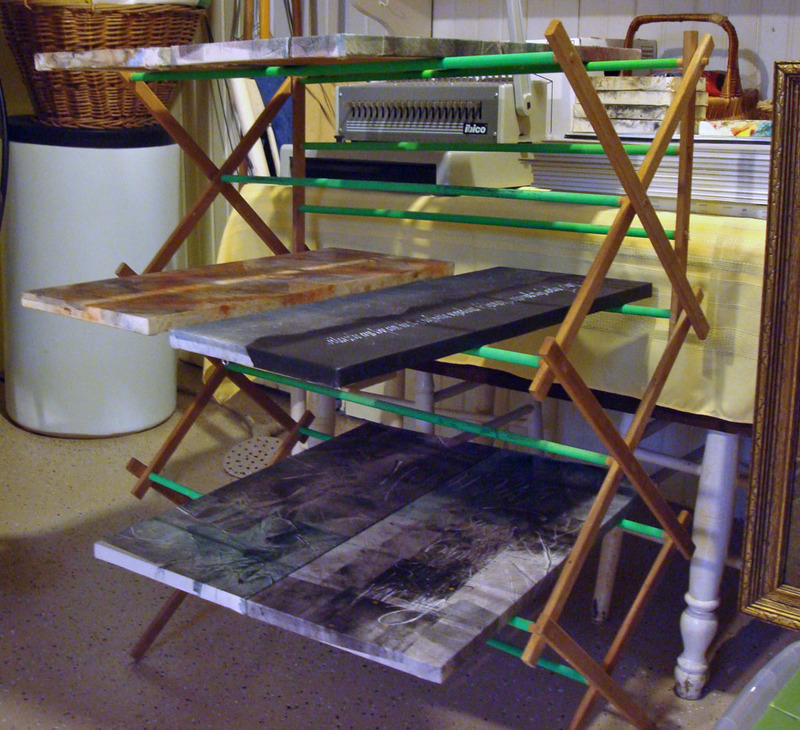 My studio is an amalgam of a furnace room, laundry room and 50’s basement “social room”. 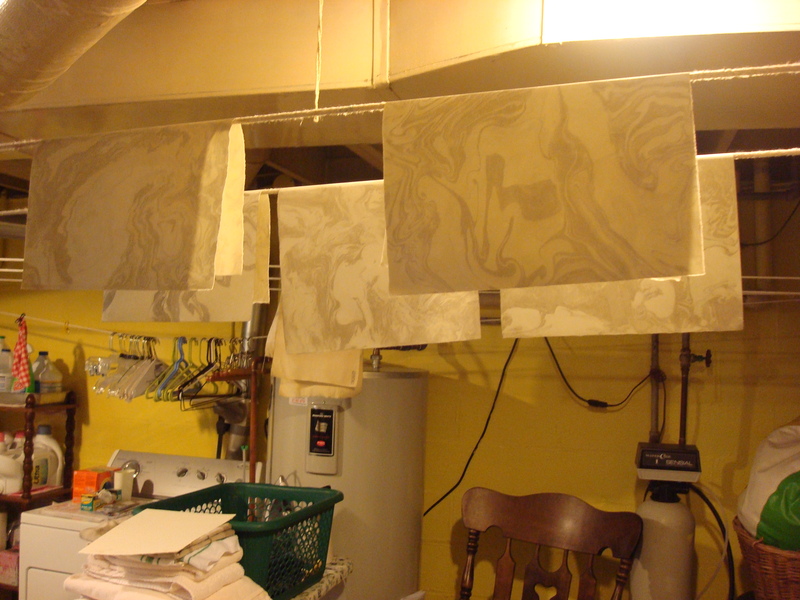 The clothes line is perfect for paste papers and an inexpensive drying rack works for canvases.